In the early Middle Ages Norway was comprised of many petty kingships. According to the sagas, it was Harald Fairhair (ca. 850 – ca. 932 AD) who united Norway into a single kingdom. Harald Fairhair’s father, Halfdan the Black, was a petty king in the regions of Vestfold and Oppland. Legend has it that Harald was only ten years old when he acceded to his father’s kingship, after Halfdan the Black fell through the ice on Randsfjorden and drowned. Harald was an ambitious king, however, and he set out to unite all the petty kingships into a single realm. According to Snorre Sturlason, the Icelandic saga-writer and historian, Harald swore that he would not cut his hair until he had achieved his goal – thus, the origin of his name. 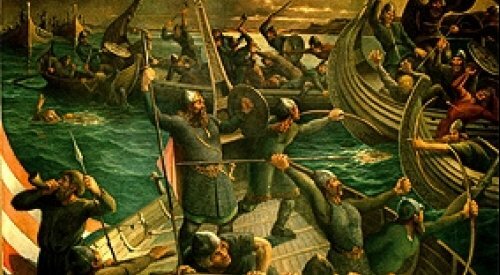 The Battle of Hafrsfjord, presumed to have taken place in about 872 AD is regarded as a critical battle in the process of unifying Norway. However, although the country became united under a single king in principle, it would be years before a permanent, stable governing structure was in place. The Leidang was to be one element in this structure. The Leidang was a shared, planned defensive coastal fleet comprised of local vessels. It was initiated by Harald Fairhair’s son, Haakon I, known as Haakon The Good (ca. 920-960 AD). The population along the coast was obliged to provide ships, manpower and provisions. Over time the duty to contribute resources to the Leidang evolved into an ordinary tax paid to the king. The Christianisation of Norway played a crucial role in the unification of the kingdom. The Christianisation was a long process, but Olav II Haraldsson (995-1030 AD) established Christianity as the kingdom’s only lawful religion, and the Battle of Stiklestad in 1030 AD is viewed as the key event. Although King Olav was killed in battle, the kingdom-wide church establishment that emerged helped to consolidate the kingdom. Following his death, King Olav was canonised. Olav the Holy became a national symbol, and his status as saint also gave legitimacy to his descendants and their claim to the throne. Throughout the 12th century the church strengthened its power by establishing permanent sees and several monasteries. The coronation of the child king Magnus Erlingson in 1163 AD was the first in Norway, and this event reinforced the central position of the church. The young king’s right to the throne came only through his mother, and was contested by Sverre Sigurdsson. King Magnus used the church’s blessing to bolster his claim to the throne. Norway had regional assemblies, known as Lagting, distributed throughout the country. These had roots dating back to the 9th century and also served as a unifying institution. In the 1270s Norway adopted its first national legal code, which was developed during the reign of Magnus the Lawmender. Foto on top: tvvest.no, bottom illustration: From the book “The Battle of Hafrsfjord”. Before Harald Fairhair, reign c. 872 – 930, there were several petty kings reigning in geographical areas in what we today know as Norway, as described in the sagas. Harald probably won his first battle against several petty kings and their armies in about the year 866. 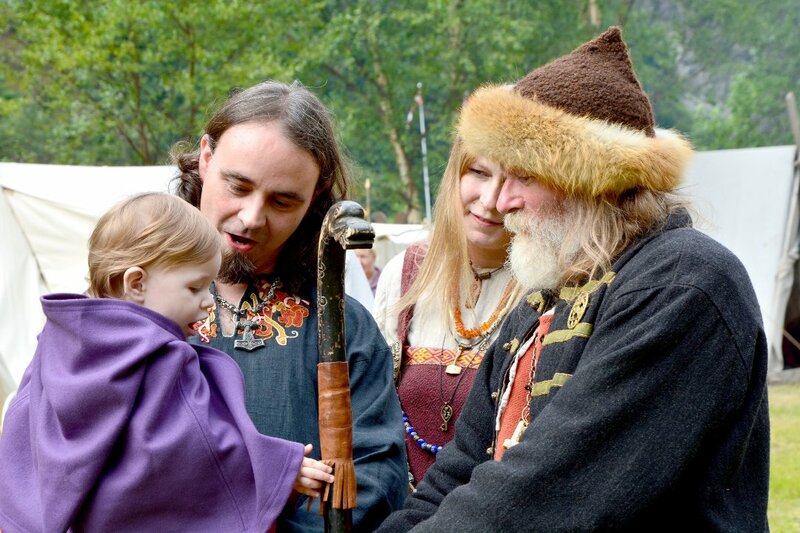 Harald himself was probably appointed king already at the age of ten for the petty kingdom of Sogn (western Norway) after his grandfather Harald Golden-Beard. North in Naumdal [today the Namdal district in Central Norway] were two brothers, kings: Herlaug and Rollaug, and they had been for three summers raising a mound or tomb of stone and lime and of wood. (…). And btw, Harald’s father Halvdan the Black was a powerful King of the Opplandene (Ringerike, Hadeland, and more) located in Easter Norway, and his burial mounds are still there named after him. Halvdan’s body was probably divided into four pieces so he could be buried in different parts of the region – so that his people would “all get a piece of him”.